When you think about it, it’s no wonder that many freelancers struggle with stress. If you’re an experienced freelancer, I bet that you know what stress feels like. Stress can keep you awake at night. It can keep you on edge during the day. Left untreated, we all know that stress can cause health problems, relationships problems, and generally lower your quality of life. Ultimately, stress will affect your freelancing business if you don’t conquer it. Unfortunately, many freelancers don’t know how to handle stress. In this post, I’ll discuss freelancing stress. I’ll share some tips on how to develop a healthy way to cope with stress. I’ll also invite you to share your own tips for coping with freelancing stress. When you freelance, there’s a lot to worry about. The list above is really just the tip of the iceberg. At any given time, an individual freelancer may be dealing with all of those issues plus additional unique personal or business-related stressors. It’s no wonder that we feel so stressed out. The type of stressor you face determines how you should respond to it. If the stressor is something you can control, then it’s up to you to take the appropriate steps to reduce your stress. An example of stress that you can control would be a work deadline that’s too tight. Another example would be an extremely difficult client. To control the first stressor, reduce the number of tight deadlines that you face by negotiating better terms when you accept a project. To control the second, refuse to work with clients who have shown themselves to be disagreeable. Too often, however, the stressor is something that you can’t control. You can relate to this type of stress if you’ve ever faced an unexpected repair bill or dealt with a serious illness. In the case of stressors that you can’t control, the best that you can do is control how you respond to them. It’s often the stressors that we can’t control that affect us the most. It’s important to respond to stress in way that is not harmful. Unfortunately, many of the ways that you could respond to stress are bad for you. While giving in to one of these temporary releases in order to deal with your stress may seem to reduce it in the short-term, eventually these bad habits will catch up with you and damage your health. The key to successfully dealing with freelancing stress and other stress is to find healthy ways to deal with it. Of course, you may not be able to conquer your stress on your own–and that’s okay. Although it’s natural to think that you should be able to overcome stress without help, that’s not always possible. If you’ve tried everything that you can think of to lower your stress level and it still won’t go away, it’s time to turn to a professional for help. We freelancers tend to be do-it-yourself folks who hesitate to ask for help. But too much stress can have serious consequences. If you need help, don’t hesitate to get it. In particular, you should always get help if the stress is keeping you from perform the basic tasks you need to do to get through a day. It’s really okay to ask for help any time you feel overwhelmed. With the right help, you can learn to deal with and conquer stress. 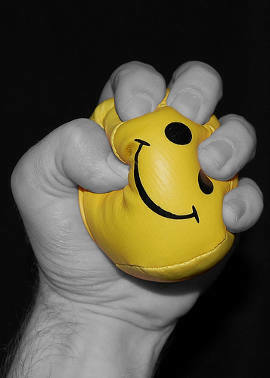 How do you deal with freelancing stress? Leave your best tips in the comments.